The IBOP is a test for horses four years and older designed to establish an objective assessment of a horse’s natural aptitude and suitability for a specific use. At the same time the IBOP is a means to collect data which the KFPS uses for breeding value estimates of sport aptitude. There are three disciplines: a riding, driving and show driving test. The owner has the authority to decide who is going to ride and train the horse and which discipline the horse will take part in. Taking part in IBOP tests is limited to twice a year. Incase the maximum of two IBOP tests takes place on one day then the horse has to complete the tests in two different disciplines. "It is about what the horses will pass on and not about what they have learned. During the test we simply want to see horses that are obedient and relaxed. The rider shouldn’t ride the horse but merely guide it. The best condition for assessing natural aptitude is a horse that moves nicely and easily through its body with a fine contact showing as much relaxation as possible." "For use of the body we like to see a horse that lowers the hindquarters and rises in the forehand. The overall picture should be uphill. Balance is about the correct sense of equilibrium shown in all paces. For the assessment of suppleness we look, for instance, at how the horse moves through the turns. A good way to assess use of the hind leg is by looking at transitions and extending paces." For the capacity to switch gears the transitions between and within the paces are evaluated. Impulsion is the horse’s natural urge to move forwards, but always controlled and dictated by the rider or driver. In the show driving test the walk is weighed once, but the scores for trot and use of the foreleg in trot are counted twice. Use of the hind legs is also weighed once and self-carriage/balance are counted twice. Additional scores are given for front, suppleness and impulsion. For show driving the canter is not assessed. Compared to the riding and driving test, the distinguishing features in trot in the IBOP show driving test are characterised by a marked moment of suspension, more and higher action in foreleg and hind leg and an overall proud posture. The IBOP is conducted by the Koninklijke Vereniging "Het Friesch Paarden-Stamboek" (KFPS). The purpose of this examination is to establish a horse's suitability for various uses and to do so with the greatest degree of objectivity. Every horse aged four or older can be presented for this examination (riding test, driving test or show driving test). Participation in more than one test on the same day is possible. Horses can be entered for the examination via the KFPS. The results of an IBOP test can be used for obtaining the star, crown or model titles (see the KFPS registration regulations). The KFPS selects a location for conducting the testing and will arrange for any necessary equipment. The IBOP can be held indoors or outdoors as determined by the KFPS. Countries other than the Netherlands. In some cases, deviations from the rules in regard to how the examination is to be administered shall be permitted for IBOP tests conducted in countries other than the Netherlands. Exactly what these are and whether they will be permitted shall be decided upon by the KFPS. Jury members must be qualified by the KFPS. Regardless of discipline, a horse may participate in an IBOP no more than twice a year. This examination may be administered on the same day or on two different days. If the maximum number of two IBOP tests are being conducted on the same day, these will have to be in two different disciplines. All tests will be ridden/driven individually. After the completion of the IBOP riding test, the participants will return to the ring in groups of two or three. At the request of the jury, the participants can be asked to repeat one or more of the components. The tests as well as an explanation of the assessment criteria can be found in the most recent edition of the KFPS test booklet. The horse being presented can be excluded for reasons to be determined by the jury committee (illness, lameness, etc.). The examinations can also be terminated by the jury committee if, in its opinion, the horse is not being presented or ridden in an acceptable manner. The owner of the horse can determine whether he/she will present the horse him/herself or whether this task will be conducted by a third party. Changing riders for various tests is also permitted. A. basic vaccination series consisting of 2 vaccinations in which the second was given at least 3 and no more than 6 weeks after the first. B. This is to have been followed by an annual vaccination that was administered no more than 12 months after the previous vaccination. C. The last vaccination must have been administered at least 1 week prior to the IBOP. Confirmation of vaccinations must be supplied in the form of a certificate signed/initialed and stamped by the veterinarian who administered the vaccination. The proof of vaccination (passport) must be sent for confirmation to the KFPS secretariat prior to the IBOP. Any horses that have not been properly vaccinated shall not be admitted to the testing site and shall not be assessed. The jury consists of two qualified jury members who have been appointed by the KFPS. The jury will record its findings on a certificate. In addition to the scores, the committee shall also provide a brief explanation and any other significant information if necessary. To authenticate the certificate, the chairperson of the jury or another officer designated by the KFPS dates and signs it. The chairperson of the jury will notify the interested parties of the findings at the conclusion of the examinations. The interested parties will be sent the certificate after the test has been conducted. The findings will also be published in Phryso and on the KFPS website. The scores for each component shall be given in half and whole points. The regulations and the dressage and driving examination book of the KNHS are an integrated element in this set of regulations. This means that the riding and driving tests are assessed as written in the riding and driving examination book of the KNHS and are based on the Scala der Africhting (scale of training). Dimensions of ring: 20 x 40 meters (indoor or outdoor). Set-up of ring: letters AFBMCHEK and minimal fencing behind the ring letters and at the corners. As described in the KNHS regulations. All elements in the examination are to be administered all at once. 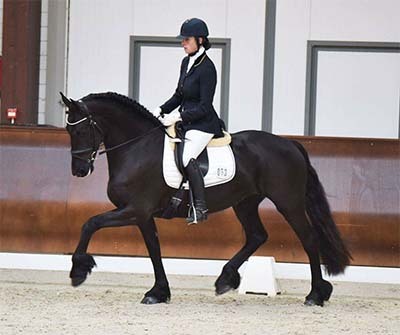 This test forms the basis for the assessment of suitability as a dressage horse. If you have any further questions about the IBOP, please contact Elaine de Boer, Vicki Knapp or Annette Gaskell.